An anti-vegan protester has been arrested after eating a raw squirrel before disgusted onlookers at a vegan market. Gruesome footage has gone viral which shows the unnamed man eating the uncooked, decapitated squirrel at the Soho Vegan Market on Rupert Street, London. The protester is a YouTuber who goes by the name Sv3rige and is sometimes known as Goatis. He has over 66,000 subscribers and often uploads video content expressing his dislike of the vegan diet. In the footage, Sv3rige can be seen chewing on the exposed innards of the still furry squirrel while speaking with police officers. Other footage shows the pony-tailed protester being cuffed and put into the back of a police van. 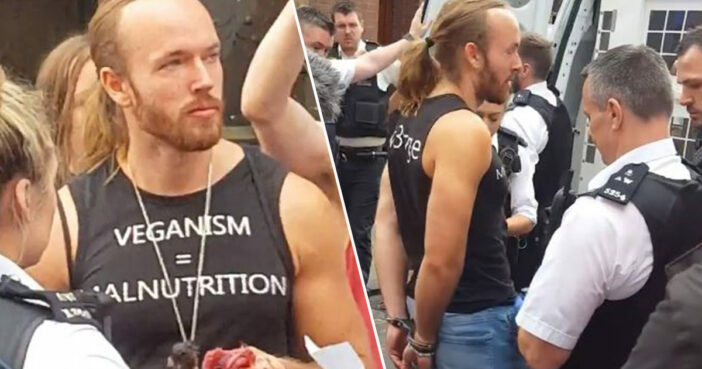 Signalling his strong stance against veganism, Sv3rige appeared to have been wearing a woodcock around his neck as well as a vest top bearing the slogan, ‘VEGANISM = MALNUTRITION’. As reported by the MailOnline, Sv3rige is the very same protester who ate a raw pig’s head at a Brighton vegan food festival just last week. We did it – it was eight of us – because veganism is malnutrition and you can’t get over 15 nutrients from plants and some of us are ex-vegans who got sick because of it. Unfortunately, Sv3rige’s unusual brand of activism may not be having quite the desired effect, and is said to have actually put onlookers off meat altogether. We knew about the planned protest and were expecting 30 protestors – 3 turned up, which was slightly sad for them and reminiscent of a Nigel Farage march.